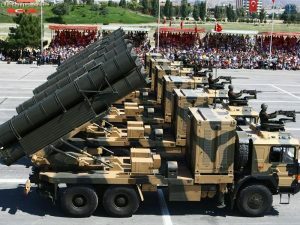 Russia and Turkey – according to fake news agency sputniknews.com – are currently negotiating a deal concerning purchases of S-400 Triumf missile systems, Rostec CEO Sergei Chemezov said Monday. “The negotiations are underway, the question of financing is being discussed right now,” Chemezov said. “European consumers face shortage of vegetables in supermarkets”, Russian state-controlled TV Pervy Kanal told its audience earlier this month, and continued: “Stores in the UK, Norway and Denmark are unusually empty. Those supplies that are left in stock are sold only under strict rationing”. 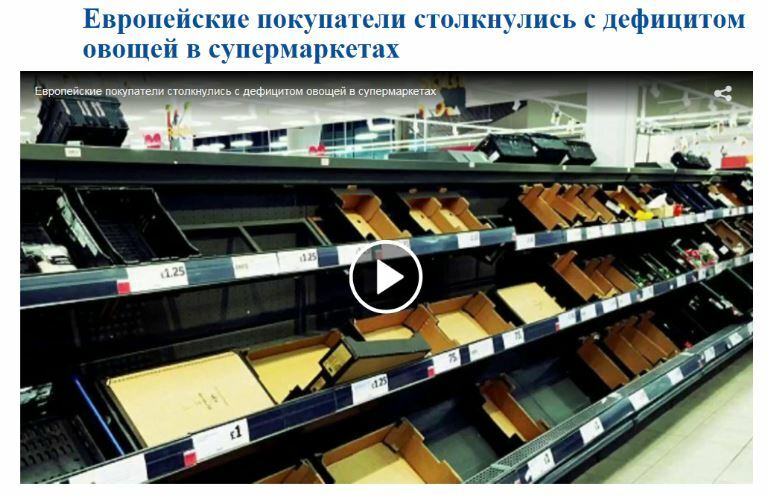 Images of empty shelves accompanied the story about the food shortage crisis. The message in the Russian context was clear: The audience should feel reminded of the famous empty stores during Soviet times, like reported by euvsdisinfo.eu. The Russian TV report was based on a news piece by the British tabloid Daily Mail, which tells almost the same sensationalist story under the headline “Supermarkets RATION salads and veg after storms in Spain devastate crops with shortages due to last until APRIL”. So what’s the story? Indeed, The Guardian has also reported about a “courgette crisis” and has documented cases of rationing of iceberg lettuce in some UK stores. In Norway, the story is very different. Norwegian daily Aftenposten picked up the Russian TV report and wrote a story headlined “Russia’s largest TV channel claims that there is rationing of vegetables in Norwegian stores”. Aftenposten went to check the facts in Norwegian supermarkets. “It is true that unstable weather, rain and frost have led to shortages of some goods. It can have a small impact on price of lettuce and other kinds of those vegetables we import and don’t keep in [winter] storage. 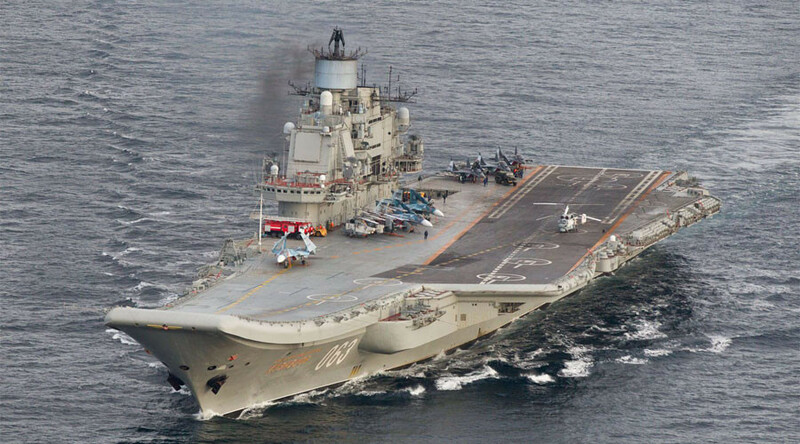 However, we cannot recognize the figures [presented by Russian TV]”, a representative of Norway’s largest importer of fruits and vegetables told Aftenposten. In Denmark, media have also been reporting about shortage of some vegetables that are traditionally imported from the south of Europe. However, according to a representative from Denmark’s market leading Dansk Supermarked Group “prices of a few goods could rise by up to 10%”, as Business.dk reports. As is often the case, disinformation has a grain of truth to it, which is then inflated and distorted with disregard to the larger context. Here it is the image that changes the impact of the story when it is transplanted to the Russian context where media feature an ongoing narrative about overall decay and despair in European societies. And Deutsche Welle reported recently that “Angela Merkel is being attacked in fake news spread by right-wing extremists”, like reported by sophos.com. With the problem real and threatening to influence democracies around the world, what is being done to combat not only the spread of fake news but also the release of hacked emails? The Telegraph reports that officials in France, Germany and the Netherlands have agreed to share information in the run-up to their respective elections this year. The European Commission, according to Media File, is committing more staff resources to its anti-disinformation task force under an initiative known as the East Stratcom Task Force. Germany, Deutsche Welle reports, is looking to setting up a centre to fight disinformation – and had urged political parties to not use social bots and fake news during campaigning. In France, 17 newsrooms are teaming up with Facebook and Google to fact-checking service called the CrossCheck project to tackle the rise of fake news, according to the BBC earlier this month. It’s not live yet, but should be up and running by February 27, The Disinformation Review reports. As far as the Netherlands is concerned, there’s no clear news on any initiatives to combat fake news specifically, but there are reports – this one in The Guardian – that votes are going to be counted manually to counteract any threat from hackers. So, that’s a brief summary of what the powers that be, political parties and the media are doing. But is there anything you can do personally? 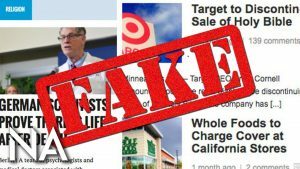 … countless fake news stories are going around because money can be earned from advertising on the websites that publish the false stories. He suggests you only need time and a familiarity with social media outlets and how they work together, rather than an understanding of technology, to hunt them out – and that’s something we all can do. And the complex ones? While he does acknowledge that experts are needed so solve some cases, he also suggests that citizens must be taught how to uncover fake news. I agree. After all, the more of us that get involved, the better the detection rate and lower the effect. If a story appeals to your feelings, be they anger or rejection, and not your thoughts, then you have to check it. FAKE NEWS FROM USA: Did President Donald Trump ban ‘full face’ feils? 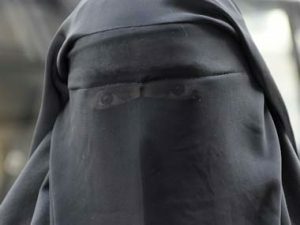 President Trump announced intent to ban “full face” veils in public places, an act presumably targeting Muslim women. One common technique employed by clickbait web sites is to social post content that consists of nothing other than a solicitation to readers to indicate whether they “support” a particular controversial political issue or decision. And as often as not, the political subjects addressed in such posts are non-existent ones fabricated for the purpose of driving click-throughs. Sites such as USA Daily Info have employed this technique in February 2017 by falsely suggesting that President Trump had “just declare to ban [‘full face’] veils in public places, posting links to a page that consisting of nothing but an image of a veiled woman and a poll posing the Yes/No question “Trump Agrees To Ban Full-Face Veils In Public Places. Do You Support This?” Beneath that content was a comment section in which readers expressed support for the non-existent ban. No legitimate news outlet reported that President Trump had announced, or even opined about, an outright ban on veils. And any contemplation of such a ban would have raised a host of constitutional issues that would have been widely debated in the public sphere and the news media. Determining whether someone will carry out a terrorist attack is a struggle for governments across the globe. However, the FBI uses a survey of 48 questions to help them decide – and one of the indicators is apparently if a person likes to go camping, like reported by rt.com. The document explains that all FBI agents working on counter-terrorism cases are required to fill out the survey through the agency’s case management system, and update answers as they learn of new information. Despite the agency’s efforts at identifying terrorist suspects before they launch any potential attacks, a recent study published by the National Consortium for the Study of Terrorism and Responses to Terrorism says such efforts are largely futile. 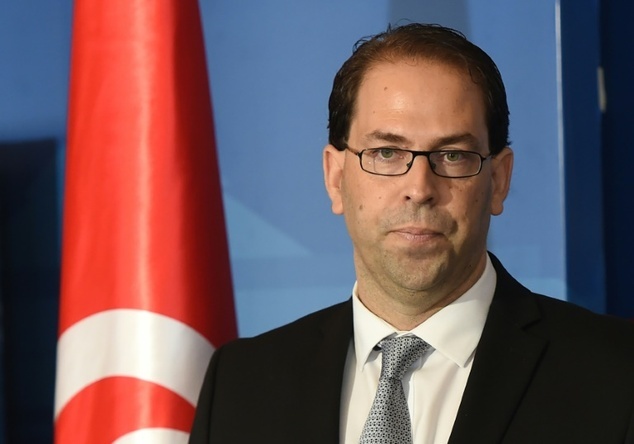 “We need to find a solution together with Libya. This is the only way,” he said. The CIA has released documents showing that US spy agencies resorted to psychics to help conduct espionage against Iran during the time of the takeover of the American embassy in Tehran, like reported iranian presstv.com. According to the newly published files, a secret team of half a dozen military-trained clairvoyants met over 200 times in a building in Fort Mead, Maryland, as part of an operation code-named Grill Flame. The psychics were employed to gather intelligence on where the American hostages were being held and how closely they were being guarded. The psychics officially worked for US Army intelligence, but their activities were monitored and supported by several government intelligence agencies as well as top commanders at the Pentagon. On November 4, 1979, a group of Iranian university students took over the US embassy, which they believed had turned into a center of espionage aimed at overthrowing the Islamic Republic in Iran following the Islamic Revolution. Fifty-two Americans from the mission were held for 444 days until January 20, 1981. Documents found at the compound later corroborated claims by revolutionary students that the US had been using its Tehran embassy to hatch plots against Iran. 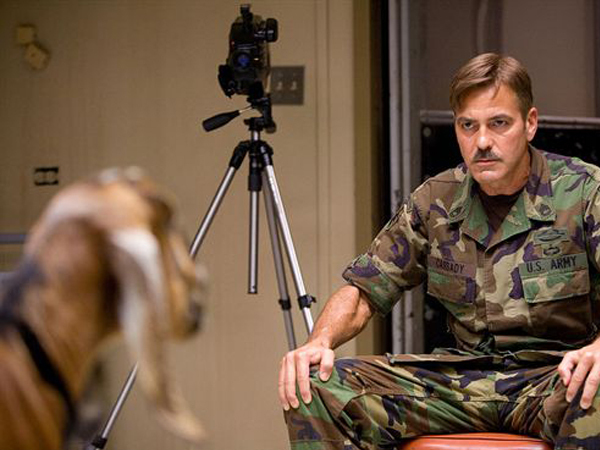 After the takeover ended, the Pentagon compared the details of the incident with 202 reports provided by the Grill Flame psychics. The comparison showed that “only seven reports” were proven correct while more than half of the reports were “entirely incorrect,” wrote an Air Force colonel on the staff of the Joint Chiefs. Although 59 reports contained information that was partly or possibly right, these same reports often included erroneous data, he added. James Randi, a former professional magician who turned his career into debunking psychics, expressed skepticism about the operation. William J. Daugherty, a CIA case officer who was among those held by the Iranian students, said he had learned of the psychics from colleagues after his release. The Grill Flame operation, which was just one part of a broader US intelligence project, carried out 26,000 telepathic forays by 227 psychics before it was shut down in 1995. For years, the US has also been using MKO terrorists to spy on Iran’s nuclear program and assassinate several scientists in collaboration with Mossad and other intelligence agencies.